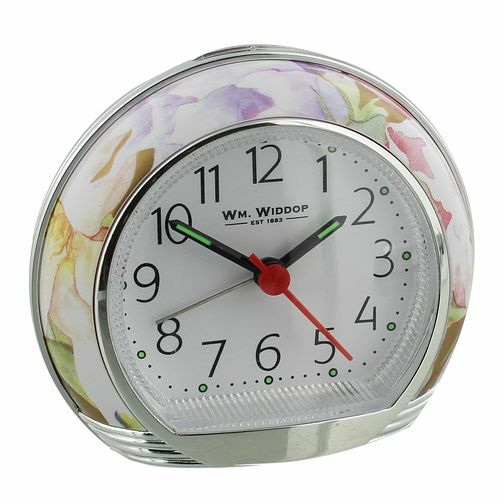 Wake up to classic floral designs and an easy-to-read clock face with this alarm clock from WM. Widdop. With luminous hands and hour markers, this alarm clock is perfect for reading the time at any time of day or night. This clock is perfect as a gift, or simply to treat yourself. WM. Widdop Floral Alarm Clock is rated 5.0 out of 5 by 2. Rated 5 out of 5 by Anonymous from I bought this product as a present for my sister it had all the features she had asked for My sister loved the alarm clock which is very attractive and small enough to use when travelling. The alarm gets louder but needs to be stopped from bottom on the back as she discovered after many attempts that the top button is for snooze only.